“Water is central to the well‐being of people and the planet,"
At the dawn of the new millennium in the year 2000, the global community committed to a raft of noble goals, the Millennium Development Goals (MDGs). These were broad policy statements ranging from halving extreme poverty rates to halting the spread of HIV/AIDS and achieving universal primary education, all by the target date of 2015. As the clock ticks towards the year 2015, many are closely watching whether delivery on these goals was achieved or not. As development practitioners churn out numbers and statistics to evaluate whether the goals of halving the poverty levels; enhancing education access; improving maternal health; reducing the infant mortality rates at birth; and others have been met, there is a sobering realization that at the centre of all these efforts, is the MDG goal on ensuring environmental sustainability, with a specific target of halving by the year 2015, the proportion of people without sustainable access to safe drinking water All these MDG’s will however rely heavily on MDG number 8, on developing a global partnership for development. (www.un.org/milleniumgoals). Indeed, this is the central message in the year 2013, which is the year of world cooperation for ‘water as an ingredient for global cooperation for peace, prosperity and sustainable development’. During the World Water Day celebration on 22nd March this year, the global community leaders made it inherently clear that the fulfillment of basic human needs, the environment, socio‐economic development and poverty reduction are all dependent on water. In this regard, cooperating around this precious resource is key for security, poverty eradication, social equity and gender equality. In an effort to transform these goals into tangible actions, UNIDO through a partnership with the Government of Slovenia is working to support a water treatment project in Kilifi County, Kenya for the local community around the Chipande Primary School. The water project was designed in 2010 with the principal objective of contributing to an increase in the proportion of the population of the Watamu-Mida community with a clean and reliable supply of drinking water. UNIDO attracted support from the Slovenia Government, which donated water treatment equipment for water purification. This equipment comprises of a standalone mobile unit for water filtration, which uses reverse osmosis. The equipment is expected to produce 130 litres per hour of pure potable water, and hence lead to the purification of the saline water that has been a permanent feature of the Chipande area for decades now. Figure : A picture of the water treatment equipment. 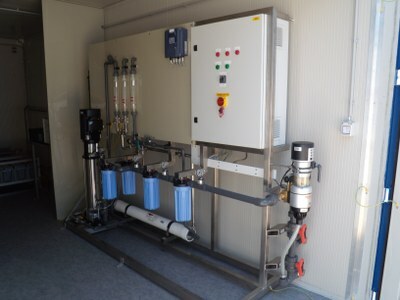 The equipment utilizes reverse osmosis technology. This equipment is expected to reduce the water borne diseases associated with the use of unhygienic water by the local communities. In this regard, the water project is an example of a tangible way that UNIDO is partnering with the Government of Slovenia, as part of the efforts by the global community, towards the eventual realization of the MDG goal number seven of ensuring environmental sustainability that includes addressing the issue of access to safe drinking water. 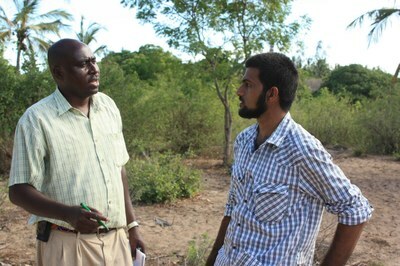 The COAST Project is providing technical support and working to mainstream some of the key results that will emerge from this project through the National Environmental Management Authority (NEMA) ( a Government of Kenya agency), for the benefit of the local communities and the residents of the Watamu Demo Site. This project also builds upon the current activities being executed by the COAST Project in the Watamu Demo Site. According to Mr. Haroon Papu, the Chair of the Chipande Water Project Community, the water problems in the area arising from the high deposits of salt in the water are a major cause of concern. The entire Chipande community comprising of close to 6000 members with a vibrant mix of -community schools, churches and private hotels suffer from a lack of potable water resulting in high incidence of water borne diseases. This background came in handy when in the year 2010, the Regional Technical Coordinator of the COAST project, Dr. Hugh Gibbon, visited the area, interacted with the local communities and noted the water stress problems affecting the area. This then served to provide the impetus for the identification and eventual selection of the site for the construction of the water purification plant. The Water Project’s connection with the Coast project is through the thematic area of Environmental Management Systems (EMS). The water project uses a Best Available Technology (BAT) which is reverse osmosis equipment powered by solar and wind power source. This technology is environmentally, socially and economically sustainable and the knowledge and expertise for its management is transferred to the community through on-site training. 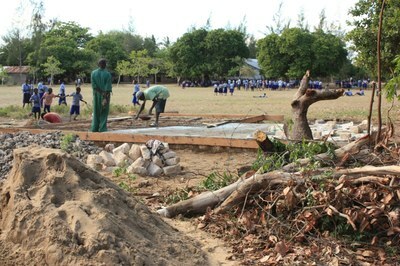 The water project formally began on 25th May 2011 with the formal agreement between UNIDO and the local communities on the details of the water project at the Chipande Primary School site, in Kilifi County. In the wake of these discussions, the local community then came together and formed a local community group comprising of the local chief, the school headmaster, elders and women representatives, to spearhead the local efforts required for the success of this project. This committee of 15 members handles issues ranging from identifying the site, obtaining requisite approvals from local leadership, provision of community support, and enhancing community buy in and ownership. It also expects to continue providing an oversight role for the sustainable use of the water from this project. This includes ensuring that the sustainability plans for this project are firmly in place. “It has been a long and hard road, people expected results overnight. Community members had different expectations, but these all bordered on availability of good, healthy water in the area”, Mr. Haroon Papu, Chair of the community group emphasizes. During this preparatory phase, the Chipande Water Project Committee has kept going, with a dedicated sense of unity and determination, and has managed to cultivate broad support and ownership among the entire community. The committee keeps encouraging the community by providing as much information as possible to the wider membership, and with the docking of the water equipment at the Port of Mombasa on 6th March, 2013, there is a general feeling that their efforts are on the verge of being realized. The Deputy Head master of the Chipande School, Mr. Wyxtone Lewa notes that the school community is waiting for the finalization of the water project with immense anticipation. It is hoped that the water project will deal with the water problems afflicting the community and ameliorate the problems associated with the continual use of the saline impure water by the students and the teachers. In the period preceding the shipment, eventual construction and installation of the water treatment equipment at Chipande Primary School, the local committee has had to surmount a number of challenges to keep the project on course. 1. Managing expectations from the entire community – The Chipande community expects this water project to provide a permanent solution to their pervasive water problems. In a way, they see this project as the silver bullet, and a magic wand to solve all their water problems. To ensure increased understanding by the local community of the technical elements of the project, the committee strives to continuously provide reliable information, while encouraging the locals to be cautiously optimistic and be ready to support the project. 2. Managing hygienic problems that may still arise from the project - It is important to note that, even with the eventual installation and operation of the water purification project, problems related to water hygiene are likely to continue. These hygienic challenges may arise from the use and re-use of contaminated water buckets by the community, leading to even more contamination of the purified water. While the technical specifications of the water equipment expect the purified water to be of high hygienic standards, the continual use of these contaminated buckets by the local community may end up negating the very principle of the water project. It may also lead to a loss of confidence and ownership by the local community, especially if these hygienic problems result in health problems. In anticipation of these, the local committee is planning to undertake aggressive awareness campaigns, and encourage the locals to buy new and cleaner water buckets, which will need to be occasionally cleaned to ensure the expected gains from this project are sustained in the long run. 3. Managing the capacity problems of the purified water – In the discussion with the members of the Chipande community, one can sense a palpable air of expectation that finally, after decades of water stress in the area, this UNIDO supported project is on the verge of offering a long term sustainable water solution to the community. However, discussions with Mr. Imran Jalalkhan, the National Coordinator working on the water project, it is clear that the expected clean water may not be sufficient for every household in the area. He explains that the 130 liter per hour only translates to close to 1300 litres of water per day, and with the reliance on renewable energy sources (wind and solar) this may not be enough for the community. A number of storage tanks have been installed within the school compound, but there is need for an investment in more tanks to ensure the water is stored to avoid unnecessary wastages and contamination if not properly stored. In the short and long run, the importance of such projects can only be realized if the issues of sustainability are firmly integrated in the implementation process. This is why the community is now already reflecting on some of the ways to enhance the sustainability of the water project. Issues such as maintenance, replacement of equipment parts arising from general wear and tear, provision of security for the water treatment facility and revenue generation require innovative responses from the community leadership. According to Mr. Imran Jalalkhan, the local community leadership is already thinking up of ways and means to enhance the sustainability and widespread awareness and education of the project. Various ideas have been floated by the members and if well executed, these may result in optimal benefits to the community, and long term solutions to the water deficit in the area. Alternative sources of energy to complement the renewable energy sources: - Some of the issues that the local community is pursuing to enhance productivity of the water plant include, sourcing for electricity to complement the renewable energy components of the project. The equipment is to run on wind and solar energy, but discussions have been held between the community and the local leaders on how to receive power under the Government of Kenya’s Rural Electrification Plan. 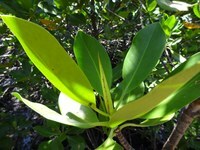 This would result in more power to sustain production even at night, and in this regard enhance the capacity of the plant. Designing a sound economic plan for the purified water: - If the capacity of the permeate water fails to satisfy all the households in the area, the Chipande Community Committee will propose a roadmap where the water will be availed to the public utilities in the area such as the school free of charge, and source for partnerships to support the bottling and selling of this water in the local community at an affordable rate. In this way, the project may generate some revenue that would be injected back into the project, and support local ownership and growth of this project. It is important to realize that the ongoing global efforts at enhancing access of potable water for water stressed communities’ needs to be actually felt at the community level. If the communities in the coastal area of the Watamu Demo Site benefit from this water project, then such success stories have to be documented and disseminated widely to encourage other such efforts in the world. The local community in Chipande understands that by benefitting from this project, they have a responsibility to design further strategies that will enhance its sustainability. 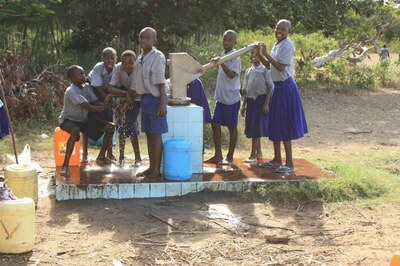 UNIDO, the Government of Kenya and the Government of Slovenia may only have injected some resources in the area, but the challenge of ensuring sustainability rests with the locals, and in the days and months to come, the local leadership will be required to give this project, the wings it requires to soar and to continue providing clean water for the community, in the long run. While the local community continues to await the flow of the pure water, the implementation of this project has had to surmount a number of logistical challenges associated with the shipment and eventual installation of this water plant. However, most of these hurdles have since been cleared, and the people of Chipande community now expectantly wait for clean water, the end product this global partnership supported by UNIDO.